Technology today has permeated every sphere of an individual’s life. With a plethora of technologically advanced devices and software at the fingertips on billions of people in the world, a new world has enfolded. Taking the advancement further is what Blockchain offers. It promises to build a world that is digitalised, open and devoid of the obstacles faced by the world currently. An ingenious innovation which first came to surface with the introduction of Bitcoin, Blockchain as a platform allows users to send ‘value’ anywhere across the globe. It is an anonymous online ledger that simplifies financial transactions by taking way the ‘middle man’ from the equation. It fills the three key roles in any transaction – recording transactions, establishing identity and contracts – thereby removing the need for an intermediary. In contrast to a bank where all the transactions and the identities of the involved parties are stored on a centralised network, Blockchain offers a more secure and private environment for carrying out transactions. If experts are to be believed, the cryptography based technology has the potential of not only disrupting the financial world but also offers unlimited potential for several other sectors. It is being touted as the technology that every business organization should take notice of. Among these constantly evolving features in Blockchain Technology organizations need to spearhead themselves to offer the best customer support and partner with the right ecommerce technology solution provider. To assist you our distinguished selection panel comprising of CEOs, CIOs, VCs, industry analysts, and magazine’s editorial board has selected a list of companies that exhibit innovative technologies and approaches. We have considered the vendor’s ability in building solutions and services that can effectively yet economically account for inventive and intuitive Blockchain Technology offerings. 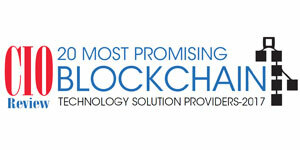 In this edition of CIO Review, we present to you “Top 20 Blockchain Technology Solution Providers – 2017”.